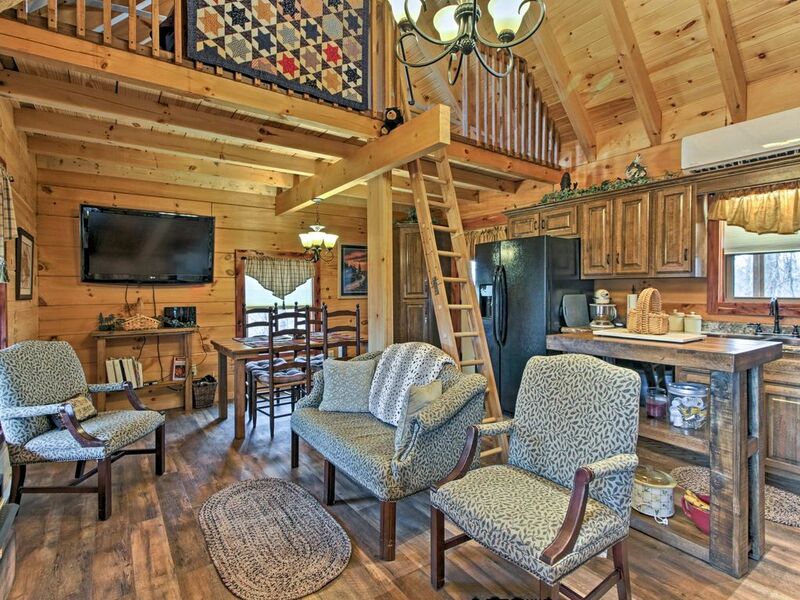 ‘New Beginnings’ is a newly-built Sevierville log cabin, ideal for your family’s Gatlinburg Area getaway! With 1 private bedroom, 1 open loft bedroom and a full bathroom, this quaint vacation rental comfortably sleeps 4 guests. With modern amenities, a cozy interior and multiple outdoor spaces, the 10-acre property won’t disappoint! Enjoy mountaintop views from the screened porch’s hot tub, warm up in front of the gas fireplace or drive 12 miles for a memorable day at the famous Dollywood! As you pull up the gravel driveway, you’ll immediately be taken with the scenic surroundings on which the 10-acre property is perched, boasting peek-a-boo mountain views. Even more impressive than the surrounding property is the cabin itself, newly built and encircled by a furnished wraparound deck. Laden with wood, the cabin’s exterior welcomes you with cheery, red accents. Inside, the 600-square-foot interior is outfitted with handmade, custom furnishings, wilderness decor, copper sinks, a full kitchen with custom oak cabinets and walls made of cedar, maple and walnut. After leisurely morning walks on the sizable property, cook up some lunch and warm your toes by the gas fireplace or watch basic cable on the flat-screen TV. If you’re not done indulging in your surroundings, unwind on the large screened porch, furnished with a bistro table and 2 cushioned chairs. Here, you can also utilize the private hot tub for some hydrotherapy or watch for local wildlife. When you’re ready to turn in for the night, you’ll be delighted to find comfortable sleeping arrangements for the whole family! The kids will love the A-frame-style ceiling and birds-eye view from the loft, appointed with 2 twin beds. Meanwhile, the heads of the household will sleep like royalty in the bedroom’s queen-sized bed. The seclusion of ‘New Beginnings’ simply can’t be beat! Situated atop 10 private acres, this property is an outdoorsman’s paradise. If you’d like to venture away from the property, don’t worry - the convenient location allows for easy access to all area attractions. For example, Dollywood and Splash Country are both just 12 miles away, providing fun and amusement for the whole family! When the weather isn’t on your side, indulge in some retail therapy at the Tanger Outlets or Coleman Factory Outlets, both within 5 miles of the property. Or, buy yourself a quirky souvenir from the expansive I R Cheap gift shop, just 4 miles away, or any of the other local specialty shops nearby! - Private mountaintop location on 10 acres, with direct access to hiking! Easy access to shopping, dining, Dollywood, Splash Country, and countless other area attractions! Clean cozy cabin on top of a mountain. Great for a couple getaway. Great cabin to get away for a couple nights! Very private! Lovely little “treehouse” on a ridge. Beautiful little place that is cozy and comfortable. If you have ever wanted to see if you could live in a “small house,” give this place a try. The setting is gorgeous. Sunset on the ridge was amazing and we watched the moon rise while enjoying the hot tub. Would love to come back. Everything about this stay was excellent. The most important thing to me was that I wanted to get away. I didn't want to see other cabins or other people. The only reason I could see any other cabins, and I had to look for them, was because it was late November and the trees had lost their leaves. The cabin is well made, it stayed warm and the inside looked very nice. The kitchen contained everything we needed, and if there was something that we wanted, the hosts were willing to do their best to provide it. The host made you feel very welcome and that they were there to help if you had any issues at all. I will be coming back. My husband and I really enjoyed the cabin! Our stay was very relaxing and peaceful. We will definitely be staying again soon.